The information published on our web site constitutes an invitation to users to submit a request of purchase which represents a legal contract and implies complete acknowledgement and acceptance of the conditions described in our regulation here below. Contracts shall be deemed to have been effected upon acceptance by Allforfood Srl (Ltd.). Allforfood Srl reserves the right to reject a request without any notification whatsoever to the user who made it. The items for sale on our web site are intended for both "end consumers" and natural persons or legal entities which are VAT registered. Our suppliers reserve the right to improve their items without prior notice. Therefore the images and spec sheets which constitute our multimedia catalogue may differ from the true technical features of our products. The actual features of the items may differ slightly in colour according to the user's video settings. The items purchased on www.allforfood.co.uk are sold directly by Allforfood Srl which is regularly registered in the Business Register of Pesaro with Tax Code 02428350413, Business Capital € 10.000,00 (ten thousand). Legal and operational headquarters of Allforfood Srl: Via L. Einaudi 114/a, 61032 Bellocchi di Fano (PU). No binding contract shall be deemed to have been effected until confirmed in writing by Allforfood. The placement of an order online, by telephone or E-mail implies that the Customer has read and accepted our general terms of sale and methods of payment as described below. The Customer must preserve a copy of such conditions (in accordance with art.50 and ss of D.lgs. 206/05) either by printing or saving it. Customers can purchase the items listed in the electronic catalogue on our web site www.allforfood.co.uk or, if necessary, come to an accordance with our staff over the phone or by email and receive customized quotations for bespoke products complete with product price, delivery fees, terms of payment, total items ordered, delivery address and VAT. Received payments will be confirmed in writing by Allforfood Srl to the Customer's E-mail address. Such confirmation will include the number and date of order, invoice and consignee data, details and prices of items, VAT included. Only once we receive the Customer's payment will we proceed with production/delivery. Prompt notification will be given to the Customer either by telephone or by E-mail if an item ordered is no longer available and/or if there is a delay in the delivery of the item compared to the estimated date indicated in the quotation/product sheet. In such cases the Customer can, in alternative, change product, wait for the item according to the new date of availability or cancel the order and request a refund for any amount paid in advance. Any right of the Customer to compensable damages is excluded, including any and all liability expressed or implied in contract for direct or indirect damages to persons and/or things, caused by the lack of acceptance, including partial acceptance, of an order. Any possible modification to orders which have already been confirmed cannot be guaranteed and will be authorized by Allforfood Srl according to its stage in the production chain. Items purchased on www.allforfood.co.uk are delivered by national and international carriers to the delivery address specified at the time of order. In some cases the Customer can collect the goods directly from the supplier's warehouse to save on delivery fees. Once the order has been made, Allforfood Srl will issue the respective delivery note whereas the invoice will be sent to the E-mail address previously specified by the Customer. These documents will be issued in conformity with the data provided by the Customer at the time of order. Once the invoice has been issued no further modifications can be made. Delivery fees are calculated according to weight of goods and destination. Quotations are non-binding and do not form a contract between the Company and the Customer, unless the order has been confirmed and sent to the respective suppliers. Import duty fees vary according to country of delivery and are at cusstomer's expense. Any details the Customer believes could be useful for the carrier to reach the place of delivery, can be specified in the order notes or by e- mail to info@allforfood.com before the goods are dispatched. Allforfood Srl arranges advance notice of arrival for each order for free in order to make delivery easier. The Customer will receive a phone call from the carrier to arrange the date and time of delivery. We therefore recommend you provide a phone number where you can be reached at all times. Advance notice of delivery represents a chance for the Customer to come to an agreement with the carrier on delivery within 48 hours from notice. Additional charges will be applied for undelivered goods due to deliveries made beyond the estimated date (48 hours from notice) or due to repeated failure to respond to the carrier's attempts to arrange delivery. Standard deliveries are made to ground floor only. National and international carriers deliver form Monday to Friday, during standard working hours, which are scheduled and specified by the carriers alone, upon which Allforfood Srl has no power of influence. Allforfood Srl is not liable for any claims of delay in delivery caused by the carrier. Items are packed with resistant materials to assure maximum safety during transport. In the event of opened and/or damaged packages, please accept the item, sign the delivery note and specify "DAMAGED PACKAGE" and describe the damage in detail on all the copies provided of the delivery note. Once the damage has been checked, please report it to Allforfood Srl by e-mail within five (5) days from delivery complete with photos of the packaging and damaged goods. If for any reason the Customer does not follow the above mentioned directions, he/she cannot later claim for any shortage or damage caused by the carrier. Allforfood Srl is committed to abide by the delivery terms indicated in the quotation. Estimated lead time (Ex-Works) is reported on each product sheet and quotation and does not include the transit time required for delivery. Lead time and transit time are in fact based on estimates and shall not be considered in any casse binding in relation to your contract with Allforfood Srl. Lead time can be checked with our staff at any time either over the telephone or by e-mail. Unpredictable delays in delivery will be promptly notified. In any case, delivery time cannot be used for claims for compensable damages or indemnification, including any and all liability expressed or implied in contract for direct or indirect damages to persons and/or things. a. Credit card: if you decide to purchase by credit card, you will be charged once the online transaction has taken place. Allforfood Srl reserves the right to ask you to provide further information, such as an ID card and/or documents to prove you are the owner of the Credit Card used for the payment. Allforfood Srl reserves the right to refuse your order, in case of failure to provide such documentation. 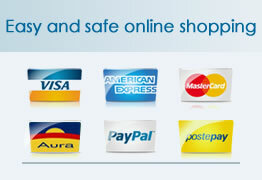 b. PayPal: PayPal is one of the most common methods of payment used worldwide. You can pay using your own PayPal account in order to complete the transaction. d. Advance bank transfer: this method of payment implies the acceptance and validity of an order, only once Allforfood Srl has received your bank transfer. You will find our bank coordinates for the transfer on the page of your order confirmation once you have completed your online order or in the quotation we send you. Please write in the reason-for-payment gap your order number, name and surname and send a copy of your payment to info@allforfood.com. End consumers (natural persons) have a right to return goods according to the laws in force. Goods may be returned within 14 working days form delivery. Prior notice must be given in writing by registered mail and email stating your will to return your goods and specifying whether you wish to return your order in part (orders comprising more than one product) or as a whole. Please also specify your order number, invoice number, the number of items ordered, product codes and your bank coordinates we require for your refund (Iban code). Goods must be returned appropriately sealed in their original packaging, all parts included (such as box, inner and outer packaging, wooden pallet and product literature or accessories supplied: user manuals, set-up tools, etc. ), to the address communicated by Allforfood Srl and shipped by a carrier hired by the Customer. Delivery of returned goods is at the Customer's cost. After having checked the integrity of the returned goods, within 30 days of return, Allforfood Srl will refund the value of the item(s), excluding delivery fees, extra services and any expenses involved in the delivery of the goods in accordance with the Customer's invoice. Goods can be returned only as a whole; no goods can be returned partially. Delivery of returned goods is under the Customer's responsibility until we receive them. You will be informed of damaged returned goods within 5 working days from arrival of goods, in order to give you enough time to make a claim to the carrier and receive a refund of the value of the item (if insured); in such case the Customer can collect the item and the request for return and refund will automatically be withdrawn. Allforfod Srl is in no way liable for damages or theft/loss of goods which are returned uninsured. In case of loss of your right to return goods, the items will remain available for pick-up at the Customer's cost. Custom-made or bespoke goods cannot be returned. The goods sold by Allforfood Srl are covered by warranty according to D.Ls.206/05. Items purchased by "end consumers" (private persons) are supplied with a 24 months parts warranty for manufacturing defects. In every other case items are sold with a 12 months parts warranty. As according to D.Lgs. 206/05, the warranty covers manufacturing defects, provided that the goods are used correctly in respect of their purpose. In the unlikely event of manufacturing defects, Allforfood Srl will deliver the equivalent spare parts required for free. Purchased goods must be checked within 5 days from delivery. Any damages noticed at delivery must be claimed to Allforfood Srl within 5 days from receipt of goods to info@allforfood.com, with reference to our product code, details and photographs of the damages. In case Allforfood Srl does not manage to return a product covered by warranty (repair or replacement), in accordance with the Customer, an item with similar or more advanced features could be supplied in replacement or a refund for the amount paid may be made. Replaced goods covered by warranty will be collected and checked for the damages claimed. Pick-up date and time will be arranged with the Customer. Goods must be returned appropriately sealed in their original packaging, all parts included. The return and re-delivery of replaced/repaired goods covered by warranty is arranged by Allforfood Srl, but at the Customer's cost. Customers must keep original packaging and product literature of the purchased goods up until warranty expiry. Allforfood is not liable for any damage to goods caused by improper use. SIGN CONDITIONALLY: please accept the package and sign the delivery note specifying "I accept conditionally", and describe the damage caused. This way, once you open the package and acknowledge the damage, you will be able to receive a refund promptly. REFUSE THE DAMAGED PACKAGE: please refuse the package if you are not able to accept it and sign conditionally or if the package is clearly damaged, without having to open it to check it. In any case, claims must be made within 5 days from delivery. A breach of these conditions shall debar Allforfood from any liability. We recommend you keep a paper or digital copy of our "general terms of sale and purchase" valid at the time of contract (reception of customer order).